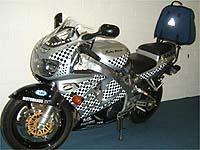 The Metropolitan Police have chosen Ventura luggage to kit out a stolen-and-recovered FireBlade that it uses as a mobile display. The bike is being used to promote safety and security in the London area, so to carry all the equipment the officers chose a Ventura Bike-Pack system. They chose to use the Blade because they found riders were more comfortable to chat when they arrived on a sports bike rather than a patrol bike. The machine will be at events throughout the year to promote both the Bikesafe scheme and the Stolen Vehicle Interactive websites. But rider PC Andy Brown has other plans in mind; " We’re hoping to increase the fleet and have a track bike for track days. " The Ventura Bike-Pack rack and bag cost £197.97. For more information call 01256-704909.